If you work with a team of visual designers to get all of your creative assets looking top notch, you know that design (and creative project management) can be a bit of a doozy. Whether you have one amazing graphic designer or a team of talented folks, it’s tricky to prioritize tasks when every group in the company believes their project is the most important. And, let’s face it, startups can be a little afraid of implementing an official (gulp)…process. But without a workflow in place, people often toss their project atop of the ever-growing heap of design requests, shout out a deadline, and run. They might include a creative brief, but if it’s not a requirement, your designer may not get any detailed info on why a project is important, or any design specs. This ambiguity can result in multiple iterations of a project (because it wasn’t clear what the design should accomplish), and can lead to frustration because of poor communication between teams. So – all this considered – how should a startup manage creative workflows so that projects are delivered on-time, on-brief, and nobody loses their mind? Well we don’t have a definitive answer, but we’ve discovered a method that works for us and it might just work for you too! At Unbounce, we’ve been successfully using Trello (a free and awesome task management tool) to outline and prioritize creative projects. *I’ve made it sound like a complicated game of Cones of Dunshire, but it’s actually really easy. In the case of our design projects, they’re organized in a board titled “Creative Department” (accessible by those who are invited to contribute). 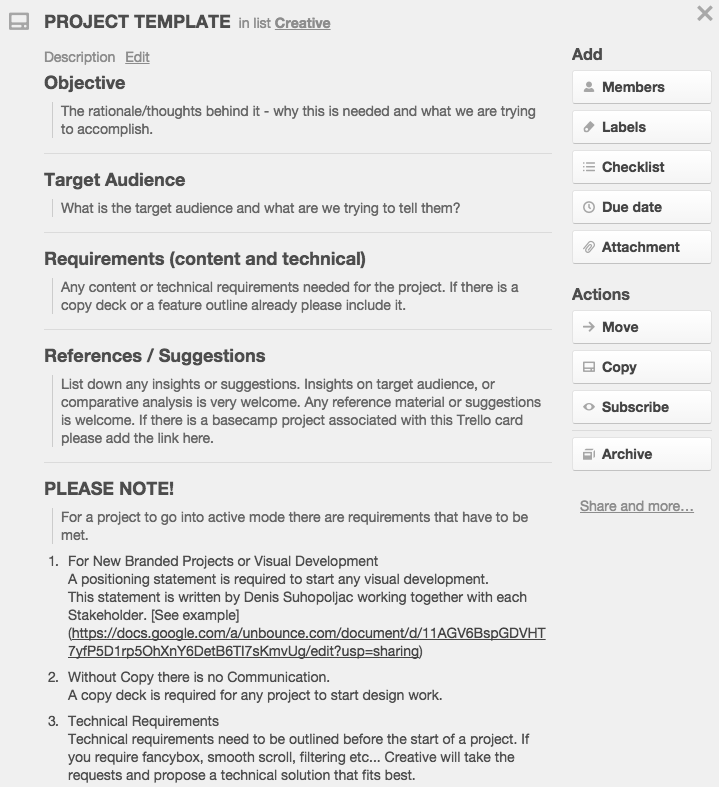 From there, tasks are organized into “lists”, which include “In Progress”, “Done”, and one list for each of the groups in the company that typically request projects. Anytime you need to request a creative project, you simply copy the Project Template card (it acts like a mini creative brief) into a new card in your department’s request list. In this template you fill out your objective, target audience, and any requirements Creative should know about. You can also add any style examples for the look you’d like to recommend. After completing the brief, you set a deadline, add the creative team manager to the board (this flags their attention), and move the card to the top of your department’s list. The visual designers at Unbounce check the board fairly often to see new project requests (but they can also set notifications to be alerted as new requests come in). Our Art Director, Denis, really cares that designers work on projects they enjoy, so he lets everyone call dibs on stuff they’d like to do based on their available bandwidth. That Denis, he’s pretty awesome, hey? A designer can claim a project by adding a comment to a card. 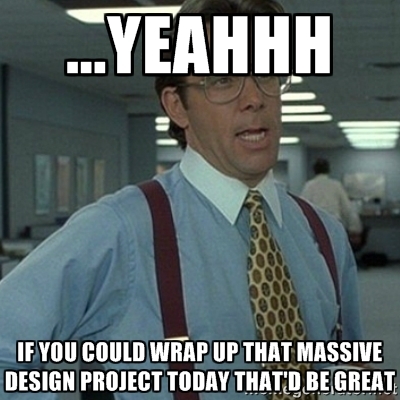 They’ll review the project template and add questions as needed. If a project’s expected to take a good chunk of time, it’ll be moved to the “in progress” list for reference there. This system works pretty well for us because stakeholders involved in a project are notified when comments are added to a card. So, if Creative doesn’t think your deadline is feasible, you’ll be alerted and can work with them to determine a new one. As a bonus, all of your creative process is tracked on the cards. This means you can keep track of your lines of thinking and creative details throughout a project’s lifespan. Even if you change directions multiple times on a single project, you can look back on your comments and changes to determine best practices for the future. We also like that Trello is a good way to visualize the stuff you’ve got on the go. When you have access to the board, you can see what the team is working on, and you get a sense of (and appreciation for) what the Creative team has time to realistically accomplish. Something many teams would love! Trello has been a great way for us to monitor the progress of creative projects, but many on the team use it to build workflow boards of their own, too. I use it to keep track of video scripts going into production, and we even have a Customer Success “On-board” to guide newbies through the onboarding process. It’s full of resources to review, helpful tips, and info about the team and your job. We use Basecamp for large campaigns that involve multiple components. Large campaigns tend to be segmented into several categories and funnels. Basecamp allows us to bring them all together in one place. From a creative standpoint it allows us to keep track of our progress while maintaining consistency and quality. Sometimes in #Startuplife, it’s typical to get a little process-evasive, but having a workflow for creative projects will save your designers from the agony of last-minute, vague, or impossible requests. …or y’know, everything’s all good. Try out a Trello board and let us know how it works out for you – or, if you use different tools for creative project management, let us know with a comment below about why they’re perfect for your team!